“It’s a miracle they’re alive. Their condition is so rare that 20 surgeons performed a 6-hour surgery to separate them. Today when we see them going to school, we’re filled with happiness. 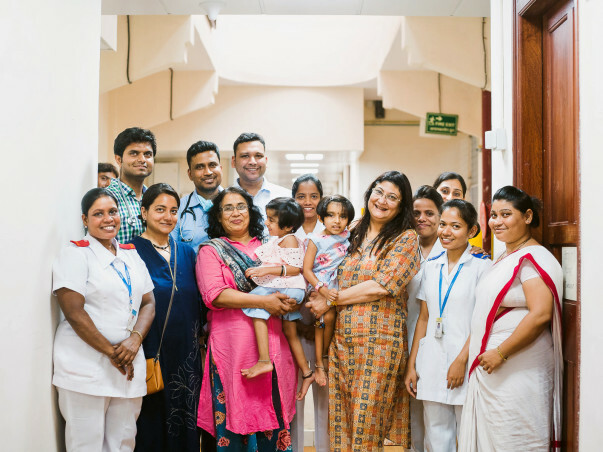 But their fight isn’t over yet.” – Dr. Minnie Bodhanwala, CEO, Wadia Hospitals. The quiet corridors of Bai Jerbai Wadia Hospital, Mumbai, reverberate with Riddhi and Siddhi’s contagious laughter every now and then. The private ward that has been their home for 5 years now is filled with their favourite toys, and the staff visits them every day. However, the twins’ life has been far from perfect. Conjoined at the pelvis from birth, the girls were abandoned by their parents and left at the hospital when they were only a few months old. What followed were years filled with struggle and miraculous milestones. Hours after their birth, Riddhi and Siddhi’s parents, from a small village in Raigad district, wanted to sacrifice them at a shrine because they thought their babies were cursed. An NGO, Pratham, rescued them from the horrific fate. 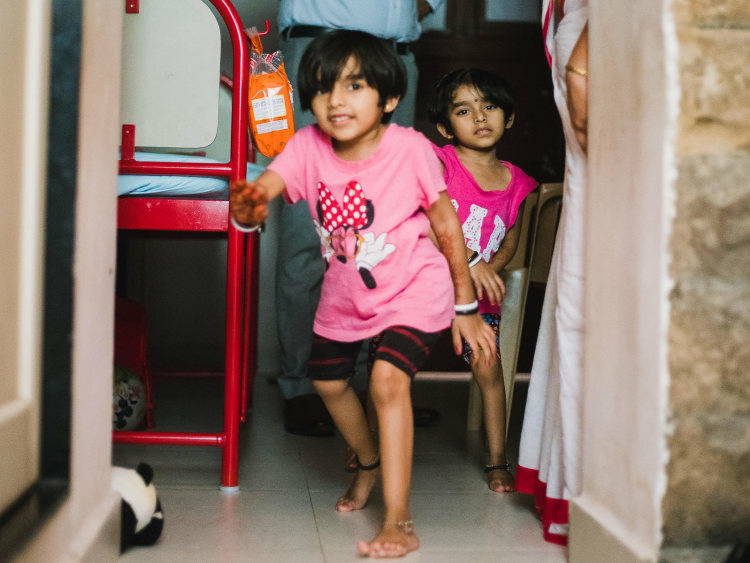 Riddhi and Siddhi’s parents soon quietly disappeared, leaving the babies terrified and alone at the hospital. The twin girls have been through the toughest times without their parents but found an entire family on their journey instead. 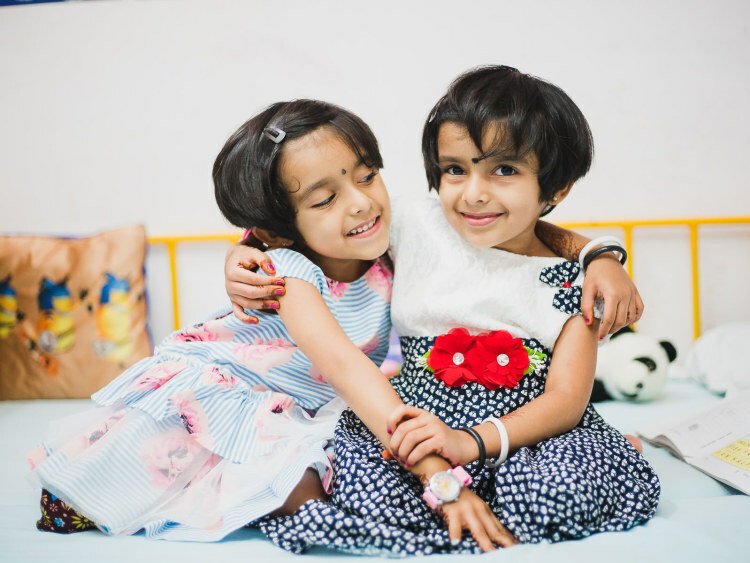 Riddhi and Siddhi turned 5-years-old on May 9, a day of celebration for the entire hospital. 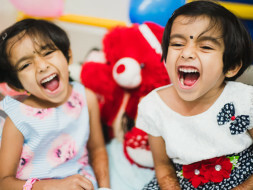 Ever since they were left at the hospital, Riddhi and Siddhi have been brought up by doctors and staff of Bai Jerbai Wadia hospital, where the twins have found a permanent home. 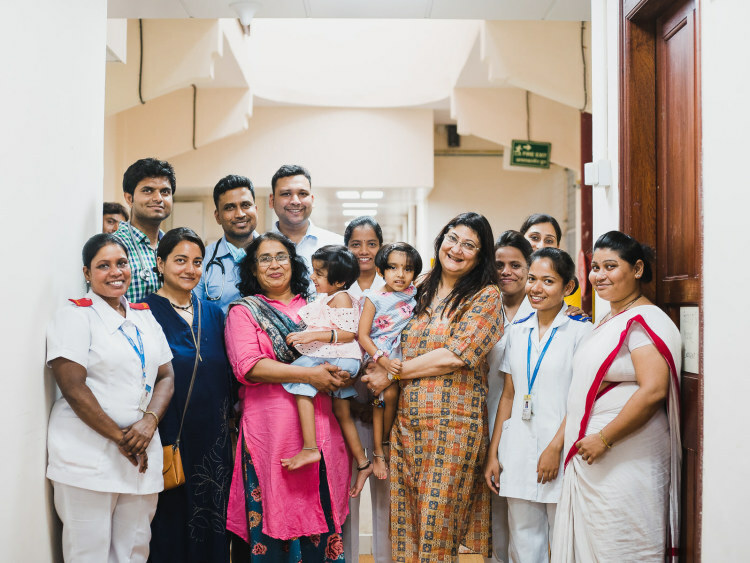 When a child asked Riddhi and Siddhi who their mom was, Riddhi happily said: “I have chhoti mumma, badi mumma, Meena mumma, Helen mumma and Minnie mumma." 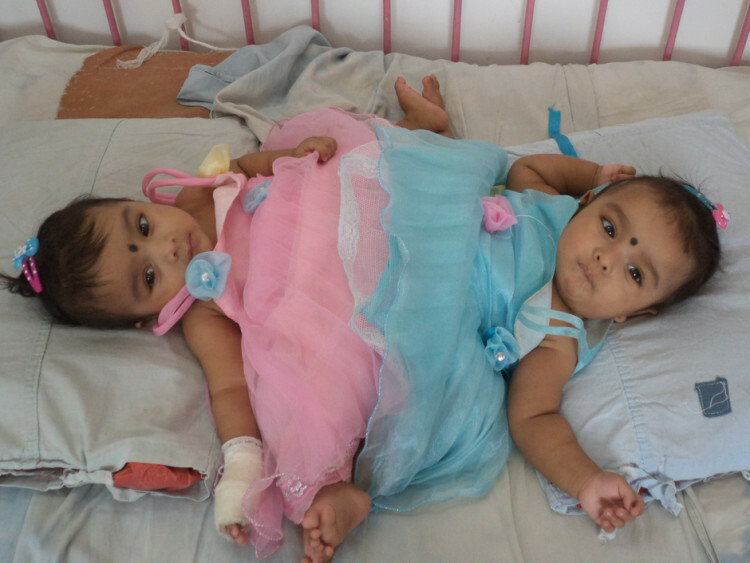 Riddhi and Siddhi had a separation surgery a year after their birth. The little fighters made it out of the complicated, high intensive surgery, but their battle was far from over. They have surgical procedures, physiotherapy and speech therapy ahead of them. Now they need at least 2 more spine correction surgeries that will let them grow and walk properly. Riddhi and Siddhi have made it this far, despite numerous obstacles. All their progress will be in vain if they can’t have the surgery. 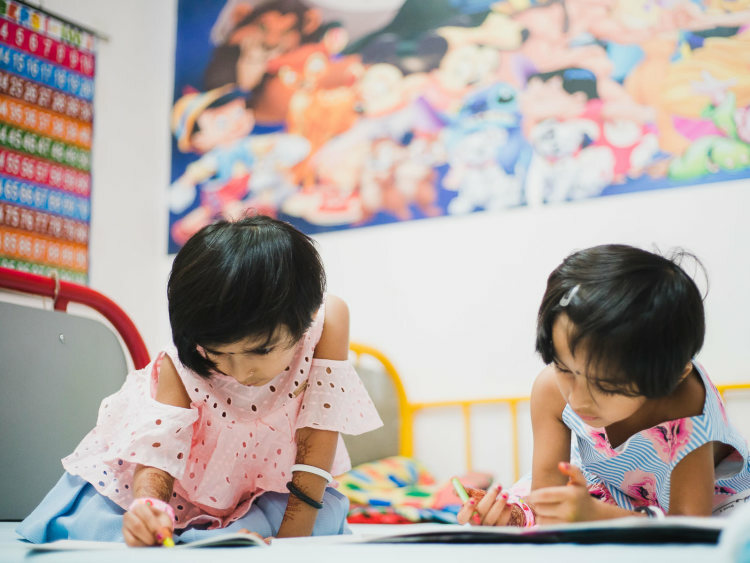 The twin girls need spine correction surgeries that will help them walk and grow up like normal children. Their life began in immense pain, but it doesn’t have to continue in suffering. 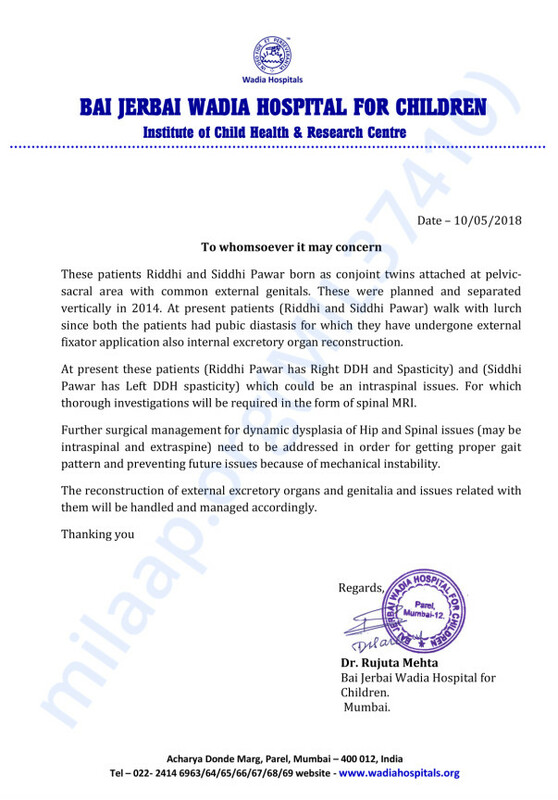 Riddhi and Siddhi need your help to get corrective surgery at the earliest. 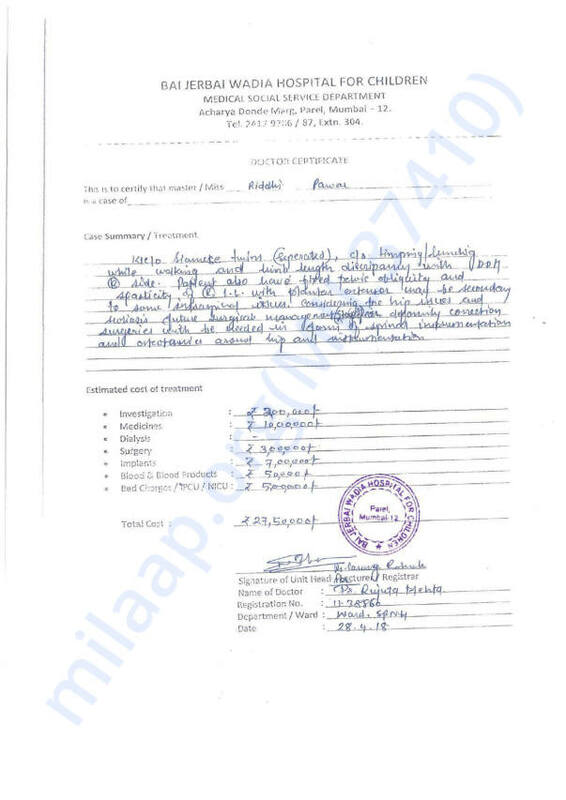 Moreover it is also about securing their future so over and above their treatment any funds towards their future education would be much appreciated. Only your support can give them a chance to a pain-free future. 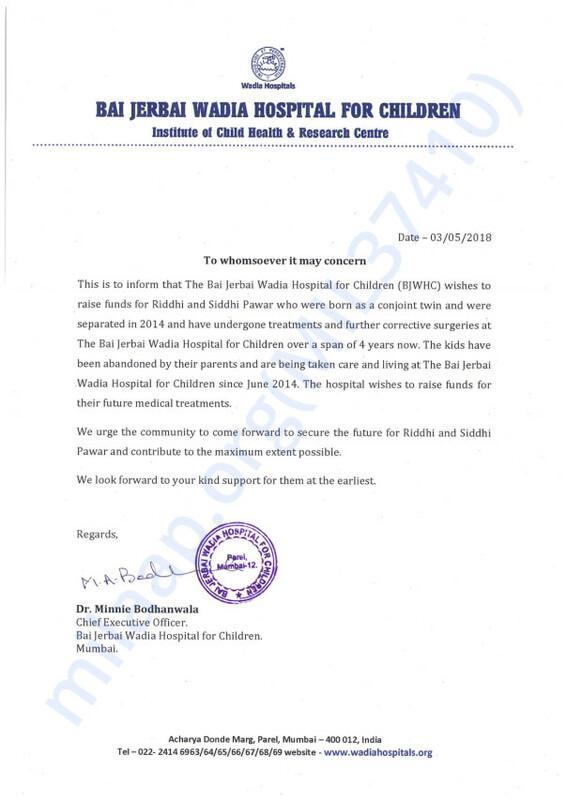 Thank you so much for the love you have shown towards both Riddhi and Siddhi. They both have started going to school and are going for regular physiotherapy and occupational therapy. 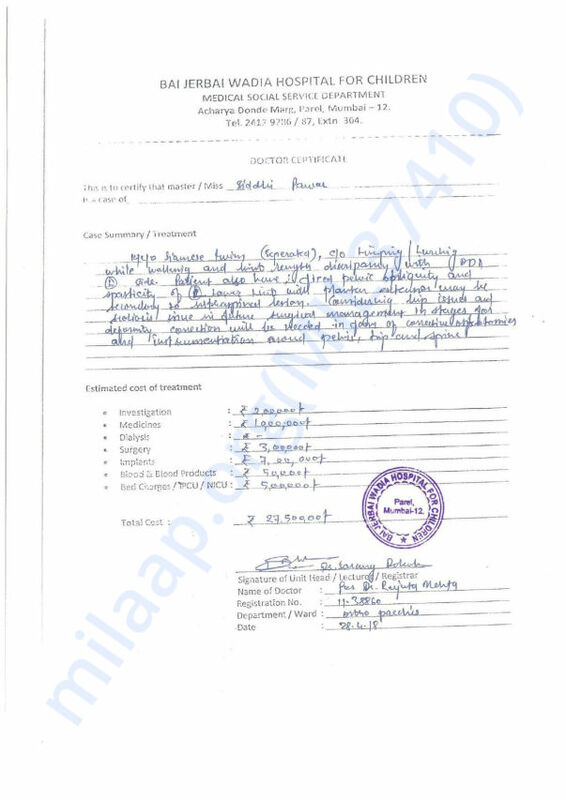 They are doing fine now and will undergo investigations for further plan of treatment. We will keep you posted on their ongoing check ups. God bless these children ! 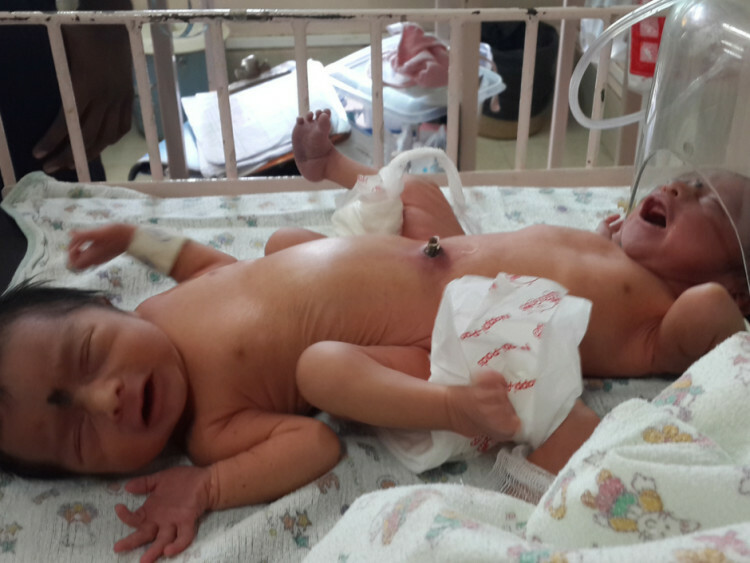 May God bless these cute little angels with good health forever.